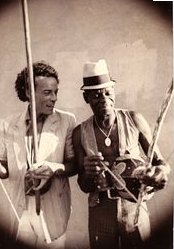 "When, some years ago, Matthias and Cobra Mansa started to work together, I thought: “This pair will be heard of”. And I waited for the results, which did come without delay. It was not only “theoretical” research of texts, engravings, iconography of the past, kept in museums or private collections. Beyond this aspect, without doubt important, the two travelled around Brazil, and also into the unbelievingly distant interior of Africa, combining adventure with the hardships and dangers of this kind of journey; combining the rigorous investigation of the historian with the gaze of the capoeirista. It is with great joy and happiness that I see, now, the final results of this true journey, unusual, daring and pioneering, which focuses on the origins of capoeira; something discussed since the beginning with the masters Bimba and Pastinha, and also something about which we knew near to nothing. I think that we, the capoeiristas, ought to support this project financially and also disseminate it. Well done Matthias and Cobrinha Mansa! And thank you so much for your wonderful contribution."